EIGHT GERMAN POLICE officers were injured late last night as concert-goers at a far-right concert flung bottles and stones at them, as the country witnesses an upsurge in anti-immigrant protests. 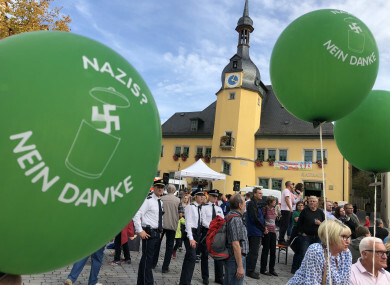 The violence prompted police to halt the gig, held under the slogan “Rock against the overflow of foreigners”, which had attracted almost 800 people at the town of Apolda in the former communist state of Thuringia. Several concert-goers sought to force through a police cordon at Apolda, throwing projectiles at officers who retaliated with pepper spray, according to a statement issued by authorities today. None of the injured officers were seriously hurt. Germany has been deeply polarised by the arrival of more than a million asylum seekers since 2015. Capitalising on the souring mood among some against new arrivals, far-right and ultra-nationalist groups have seen a revival while the anti-immigration Alternative for Germany (AfD) has also entered parliament. The concert was due to be held at another small town in the state, but authorities blocked the event, forcing its last minute move to Apolda. Email “Eight police hurt in clashes at far-right gig in Germany”. Feedback on “Eight police hurt in clashes at far-right gig in Germany”.